Stunning views of Lake Tahoe make the Beachcomber Inn the ultimate vacation getaway. Make the Beachcomber Inn your home away from home as a fully deeded owner. Timeshare exchange allows you to stay with us or use them to go anywhere in the world. Where the only thing between you and the lake, is the sand. Located along 200 feet (60 meters) of prime Lake Tahoe beachfront, the Beachcomber Inn is a small, intimate, family-friendly resort on the heart of South Lake Tahoe. The resort’s location is ideal to enjoy the endless beauty and recreation opportunities that Lake Tahoe has to offer: all year long! 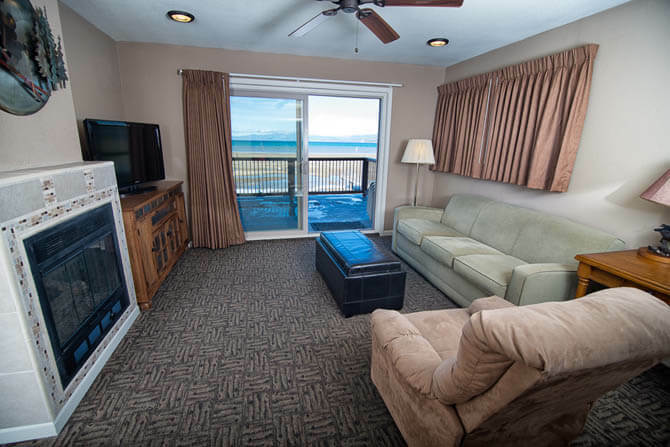 The Beachcomber Inn’s 17 suites and 4 studios all have panoramic views of Lake Tahoe and the surrounding mountain peaks. Guest amenities include: a private boat dock, seasonal pool and spa, summer member and public mooring buoy rentals, BBQ viewing deck and a common-area game room. South Lake Tahoe is an ideal place for your vacation or timeshare purchase as the town offers the combination of spectacular scenery with endless options of things to do year-round, including water sports, snow skiing, world-class entertainment, gaming, dining and shopping. Beachcomber Inn offers 17 suites & 4 studios with unobstructed views of the lake making for the ultimate Tahoe getaway. Imagine owning a slice of heaven steps from the sapphire blue waters of Lake Tahoe. Exchange your timeshare week(s) or points to stay with us or use them to go anywhere in the world. Learn About Our Exchange Programs! All the resort’s spacious and remodeled units have sweeping views of the lake and mountains, and each comes equipped with cooking facilities. A limited number of units are furnished with gas fireplaces, perfect for a romantic retreat, or cozying up to in the off-season. Guests Love the Beachcomber Inn! We were so-o impressed with this place. I loved how small and quaint that it was. The staff was so welcoming. It was very clean inside with plenty of linen and towels readily available. I love the Beachcomber Inn. It is a great place to bring your family because it is quiet, peaceful, and has the most amazing views. This is by far the best kept little secret in South Lake Tahoe!! Totally affordable and the most amazing views from every room. The staff are awesome and always willing to do what they can to make your stay even more enjoyable.